Jonny Tuffey. Pic by Pacemaker. Glenavon have gained a double contract boost with Jonny Tuffey and Caolan Marron both putting pen to paper on extensions. 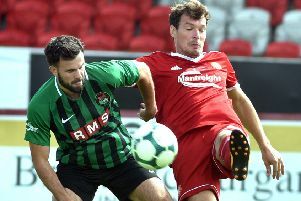 Lurgan Blues boss Gary Hamilton confirmed his delight at securing two key players from within this season’s defensive set-up on a long-term basis. Caolan Marron. Pic by PressEye Ltd.
Marron, who progressed from the reserves into the senior squad this season, has signed a two-year extension that will run until the end of the 2018-19 campaign. Tuffey’s four-year extension provides the option of a fifth season. Hamilton offered special praise to Marron in this week’s Lurgan Mail following victory over Armagh City. “Another player who is learning the ropes week by week is young Caolan Marron,” said Hamilton. “For a young lad to come into the centre-back position and look so assured this season is really encouraging. “It is a credit to the player but also to the people around the club who have been helping him make that step up into the first-team squad. “He has been so consistent this season and was, once again, really solid on Saturday. “This game is all about stepping stones and coming up against the various tests it provides. “Caolan, in a similar way to past young players like Rhys Marshall, James Singleton and Mark Sykes, is working hard and keeping his focus.